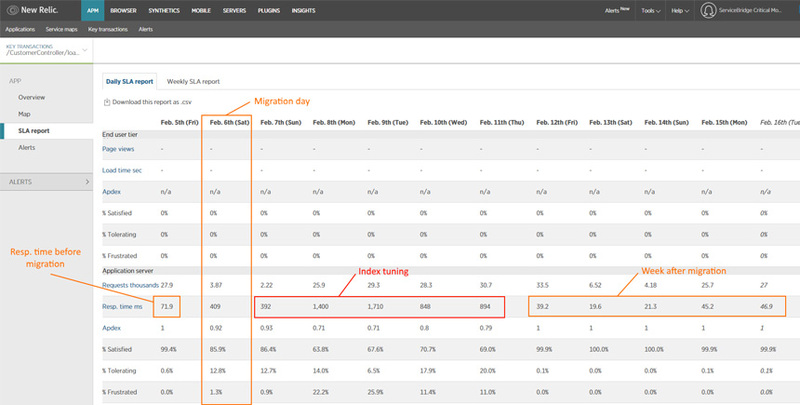 We recently moved the infrastructure of a live SaaS product from Windows Azure Cloud to Amazon AWS. While we’re still pleased with the decision and are reaping cost saving benefits, we wanted to see if we could push our optimization further. Managing our hosting costs went down, but one line item in the AWS bill was still exceptionally large in comparison to others - the Amazon RDS for SQL Server. The product is successful and the customer count is constantly growing, so we can foresee the need to spin up the 3rd and 4th shards in near future. Each fully utilized shard would cost us an additional $911.04 per month. Since we’re trying to keep our hosting expenses lower than 5% of revenue, such growth tendencies are not satisfactory based on our current strategy. The answer now obvious – look for cheaper and/or open source alternatives. Two alternatives were considered: MySQL and PostgreSQL. Due to maturity, current development velocity, and future potential PostgreSQL was chosen as the next database engine. We lucked out. Since day one our strategy has been to keep the database tiny. Our business logic was stored in the software layer, while the database was responsible only for data storage. The most common objects in our database are tables, views, and so on (primary keys, foreign keys, indexes, etc.). We also had several stored procedures. Rewriting these required quite a different understanding of how a batch of SQL statements is executed in PostgreSQL. First of all, there is no definition such as „stored procedure” in PostgreSQL. There are functions that has have return clause and that return clause determines whether a function is a „function“ or a „stored procedure“. Another difference is that in MSSQL stored procedure local variables can be declared anywhere, however in PostgreSQL functions local variables have to be declared at the beginning of the function. Obviously it's only a syntax difference that requires a habit change. View syntax is the same as in MSSQL. Minor note: views can not be altered once metadata of a view is changed (added / removed column or changed column data type). In that case you have to drop a view and recreate it once again. Primary keys. Concept is the same, however in PostgreSQL primary key is always clustered. Meanwhile in MSSQL there is a choice whether primary key is clustered or not – if primary key is non-clustered, then any one other index could be created as clustered. It also should be noted that in MSSQL no matter what kind of primary key is created (clustered or non-clustered), an index will be created as well (respectively clustered or non-clustered). In PostgreSQL you have to foresee the need to disable/enable foreign key on creation time, because the foreign key needs to be flagged as deferrable. Checking of constraints that are deferrable can be postponed until the end of the transaction using the SET CONSTRAINTS command. Indexes. There are several main differences between MSSQL and PostgreSQL in terms of indexes. There are no clustered indexes in PostgreSQL. All indexes are non-clustered by default. There are no indexes with included columns in PostgreSQL. There are two choices when migrating indexes to PostgreSQL: add included columns to index key column list or exclude included columns from index completely. Both options were used in our product migration depending on each case correspondingly. Overall, indexes in PostgreSQL have to be more accurate and be created more responsibly if you want an index to be used in the query execution plan. Attention should be paid to column order in indexes, because an index is most efficient when there are constraints on the leading (leftmost) columns. Business layer changes can be split into two categories: nHibernate changes and HQL (or plain SQL) changes. nHibernate changes. Majority of our business layer uses nHibernate ORM. Most changes were in configuration. Instead of using MsSql2012Dialect we switched to PostgreSQLDialect, changed connection strings and installed Npgsql driver nuget package. Additionally, we had to rewrite several registered functions, which we use via extended dialect (e.g. AddYears, AddDays, etc.). Multiple SQL statements in one query must be separated with semi-colons. In Microsoft SQL Server 2014 T-SQL statement terminator is still optional, even if Microsoft highly recommends the use of a semi-colon because in future versions it will become required. Boolean (Bit) values in MSSQL are 0 and 1. In PostgreSQL they have to be replaced with true / false or the equivalent of “t” and “f”. String concatenation in MSSQL is “SELECT FirstName + LastName FROM...”. In PostgreSQL equivalent is “SELECT FirstName || LastName FROM...”. There is no ISNULL function in PostgreSQL. Use COALESCE instead. Use CITEXT extension. The CITEXT extension allows you to create case insensitive columns, so you can avoid things like the lower function. In fact, this extension calls the lower function automatically so that you don’t have to do it manually. Created RDS instances with initial database schema (tables, views and functions). Deployed all websites with PostgreSQL changes to production. App_Offline.htm file was included to notify users of a migration taking place and the fact that no data could be read or written at the time. Exported data from MSSQL to CSV files table by table using the BCP tool. Database sizes were relatively small – 1st shard was about 35GB in total, so export to CSV files worked well for us. BCP does have one pitfall – it doesn’t support export to CSV with UTF-8 encoding. So we had to export to CSV using UTF-16 encoding and later convert it to UTF-8. Changed CSV file encoding from UTF-16 to UTF-8 using iconv tool. Imported CSV files to corresponding tables using PSQL (PostgreSQL interactive terminal) COPY command. Created foreign keys and indexes. These objects were created after data migration due to better performance. Removed App_Offline.htm from all websites. The next request into the application caused IIS to load the application and app-domain again, and operations continued along as normal. Overall websites were down for less than two hours and as soon as App_Offline.htm file was removed the system started to operate as usual. Several minor bugs were found in the hours following migration, but were immediately fixed prior to business start on Monday. While the migration itself was well planned and did go smooth we had concerns about PostgreSQL performance with real load on peak times. We ran jMeter load tests before migration and were happy with the query execution time, so production performance was the last test. Our concerns were reasonable, because as mentioned before, indexes don’t fit one to one as they were tuned on Microsoft SQL Server. During post-migration week we kept an eye on slow performing queries and polished indexes to catch up to MSSQL performance levels and sometimes even achieved better execution times (picture below). Additionally, we realized that PostgreSQL doesn’t utilize the same amount of memory as we were accustomed with MSSQL. So we had to tune up PostgreSQL RDS instance configuration to gain better performance. Dave’s Head blog post pointed us in the right direction regarding PostgreSQL configuration on Amazon RDS. After configuration changes we decided to keep the same memory size as we had on MSSQL databases (for future growth), but increased second shard vCPU from 4 to 8 – changed instance type from r3.xlarge to m4.2xlarge. While current $530 saving per month are not life-changing, this architectural decision will become very advantageous as we keep spinning up new database shards. 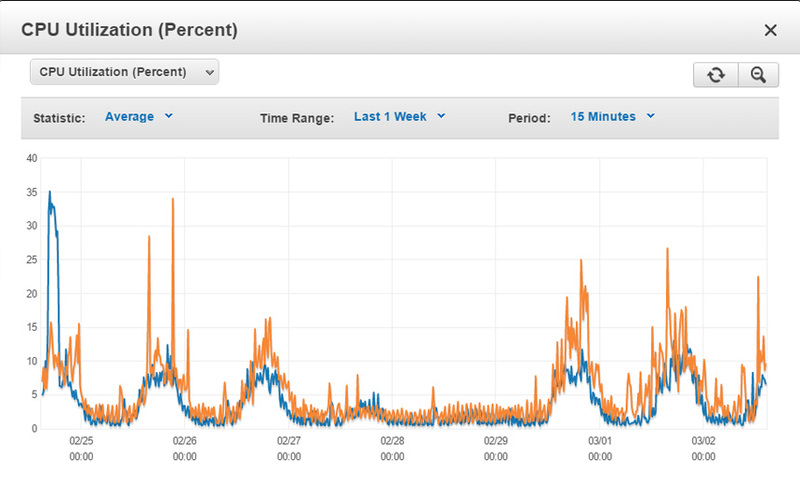 PostgreSQL works reliably and is stable on peak time. Picture below shows CPU utilization of both shards. While there are financial advantages, there are also disadvantages in terms of tools. If you are used to working with SQL Server Management Studio, then PostgreSQL GUI tools might appear a bit… rough. PostgreSQL GUI tools are not as good as SSMS, but you can freely choose from several alternatives (even if none of them are perfect). Our team members do not have a favorite yet, so each decides based on needs: PgAdmin, HeidiSQL, DataGrip, EMS. Our application serves ~3,500 active users on a variety of desktop and mobile devices. While not massive, it’s a great platform for us to flex our muscles and adopt technologies that cut costs, improve performance, and help us continue scaling the business. While current cost savings may not be game-changing, we believe long term this is the right investment to grow the infrastructure responsibly and efficiently.